Henri Inchauspé PHD – From LISA pathfinder to eLISA: building of a dynamics simulator for the eLISA space mission. 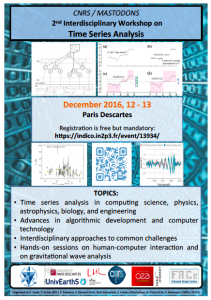 On December 12-13, the Paris Descartes University in Paris will host an interdisciplinary meeting on time series data analysis, supported by the Mastodons TimeClean proposal and by the LabEx UnivEarthS Valorisation work package. This two-day workshop is organised jointly by the Astroparticle and Cosmology laboratory (APC), CNRS/IN2P3, DSM/Irfu/SAp CEA Saclay, Laboratore Leprince-Ringuet (LLR) and LIPADE laboratory of the Paris Decartes University. both computational power and resources to their limit. In order to analyse data from current and future experiments, new technology, and the development of more efficient and smarter algorithms, are required. 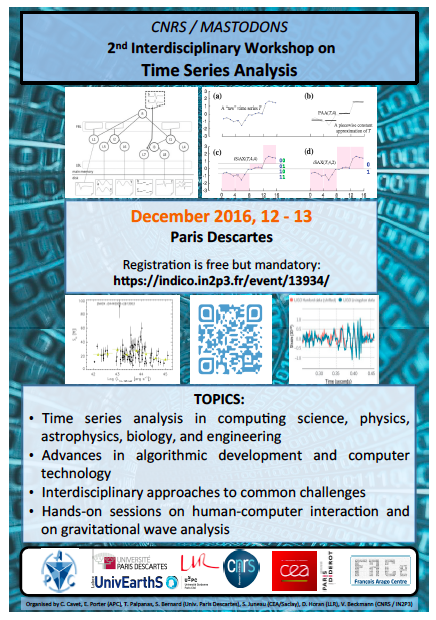 This workshop brings together data analysts from the fields of astrophysics, biology, computing science and engineering, and will focus on advances in academia and industry in both algorithmic development and computing technology in the area of time-series analysis. Find informations about the 8th scientific committee on this link. The aim of UnivEarthS is to combine the scientific expertise, technical know how, experience in space experiments, and human resources of three research institutes, all international leaders in their disciplinary field, in order to develop original interdisciplinary research projects. Their expertise includes Earth and environmental sciences (IPGP), planetary sciences (IPGP, AIM), high energy astrophysics (AIM, APC), cosmology and fundamental physics (APC).